WESTON I — Nawada Landscape Design, Inc.
Master landscape plans were developed to create a series of spaces within this blank palette while celebrating the bordering woodlands and topography. The pergola was designed to be a focal point and destination spot within the garden. It was constructed with old reclaimed beams & new wood. New trees, shrubs and vines were installed to anchor the perimeter of the structure. Native boulders found during excavation were thoughtfully placed to accent the pergola. Other amenities included a built-in BBQ, fireplace, in-ground spa, patio and sitting walls. Each destination spot was uniquely designed to connect to the vast open space on the property. 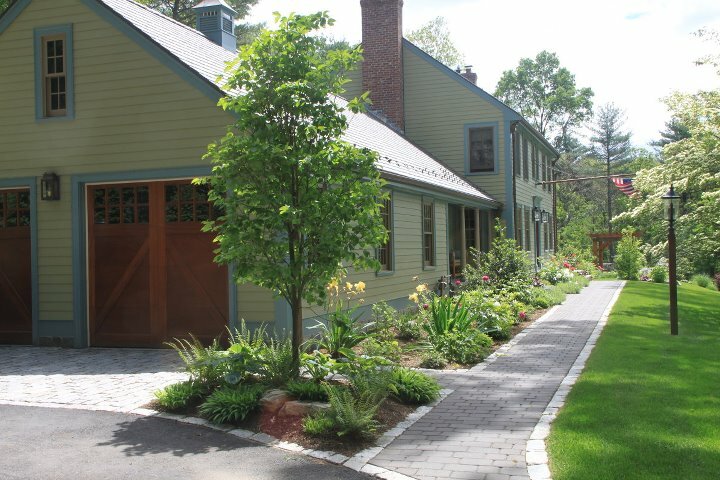 Drought resistant and native plantings surround the foundation of the house and help retain the front hillside. The variety of plants selected emphasize the beauty of each season in New England.